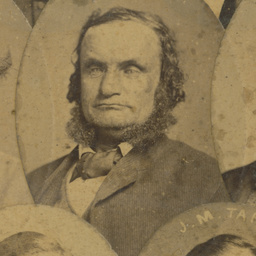 John Townsend arrived in South Australia in May 1839 on board the ship the "Planter". Dairyman, gardener, licensed victualler; Adelaide, Campbelltown, Norwood. An album compiled by Adelaide photographer, Townsend Duryea, with the title 'Duryea's Adelaide Album' embossed on the front cover. The first 'page' is a panorama of Adelaide, comprising five roughly uniform panels, mounted on linen to form a continuous image 125 x 895 mm (the linen measures 248 x 940 mm, and folds into three equal sections to fit into the album). The other photographs in the album mostly relate to the visit of Prince Alfred, the Duke of Edinburgh, to Adelaide. See B 73122/1 to B 73122/14 for details on individual photographs. 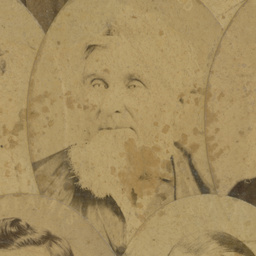 The photographic composite (mosaic) B 8235/1 holds 708 portraits. 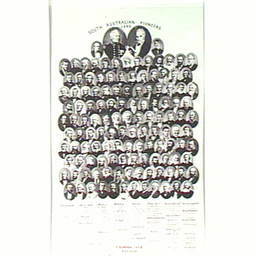 A further 27 in the upper left section are missing due to damage. 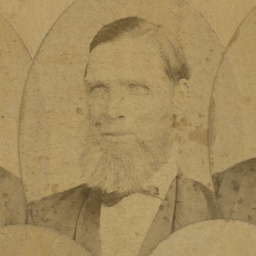 (An unnamed portrait has been placed in the gap at B 8235 23E, instead of the portrait of John Moore missing due to damage .) 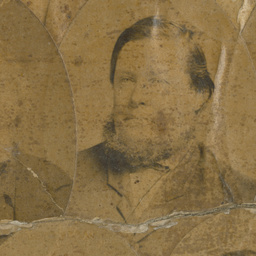 A newspaper article that refers to the donation of the mosaic to the Public Library of South Australia in 1894 by Mr CH Hussey of Port Elliot states that it was damaged when Duryea's studio was destroyed by fire on 18 April 1875. (The Advertiser, 17 November 1910.) Mr Hussey's portrait is at B 8235/1 1A. An album compiled by Adelaide photographer, Townsend Duryea, with the title 'Duryea's Adelaide Album' embossed on the front cover. The first 'page' is a panorama of Adelaide, comprising five roughly uniform panels, mounted on linen to form a continuous image 12.5 x 89.5 mm (the linen measures 248 x 940 mm, and folds into three equal sections to fit into the album). The other photographs in the album show King William Street, Victoria Square, the Torrens River and Botanic Gardens. 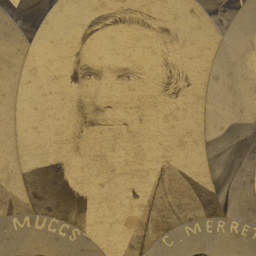 A book plate at the front indicates that it was originally owned by Edward Angas Johnson. 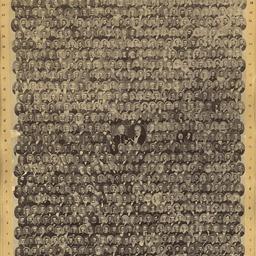 Photographic copy of B 8235/1, mounted on card , containing 734 portraits and handwritten alphanumeric coordinates. This print represents the original mosaic (B 8235/1) before it was damaged by fire and lost 27 portraits. It would have been one of the smaller versions of the original mosaic that Duryea made available for sale. It was purchased by the South Australian Archives from the Old Curiosity Shop, Rundle Street, Adelaide in 1939. 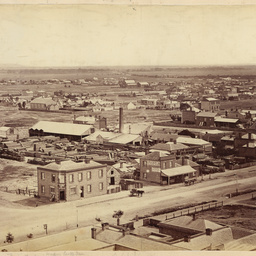 View of Adelaide looking south-west, taken by Townsend Duryea from the tower of the Adelaide General Post Office in 1870. In the foreground can be seen the business of C. Farr, builder & timber merchant, with Grote Street crossing diagonally through the image. 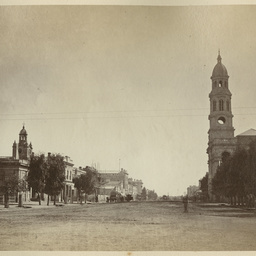 In the middle background of the view can be seen St. Luke's Anglican Church (consecrated in 1856), on the western edge of Whitmore Square, and behind it, the road to Glenelg. To see a summary of this panorama group do a number search on B 16004. 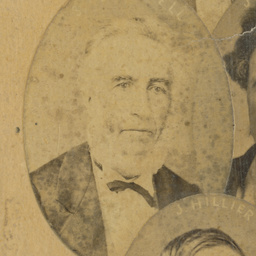 A collection of studio portraits under the title 'South Australian Pioneers 1838', with 'T. 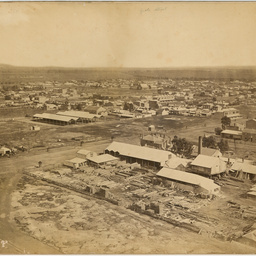 Duryea, Adelaide, 1872' at the bottom. 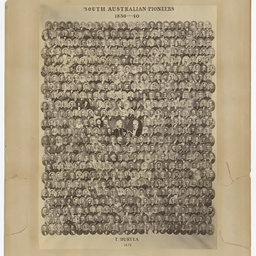 This mosaic includes portraits of Governor Sir John Hindmarsh and Governor George Gawler above 116 portraits, and the handwritten names of the colonists are listed under the ships they arrived in on both sides of the portraits. View of south western Adelaide from the Town Hall Tower, featuring the intersection of Franklin Street and Victoria Square. Open paddocks, residential and business premises can be seen with parklands and hills in the distance. In the foreground is the Windsor Castle Hotel, licencee W. Haylock. The premises of Charles Farr, Builder and Timber Merchant displays a large array of cut timber in piles. Part of Panorama of Adelaide / Photographed from the Town Hall tower by Townsend Duryea in 1865 / Copied in 15 sections from B 5099. 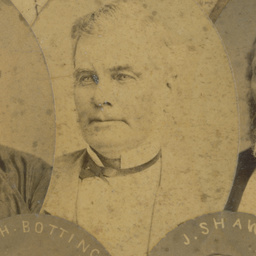 A collection of studio portraits under the title 'South Australian Pioneers 1838', with 'T. 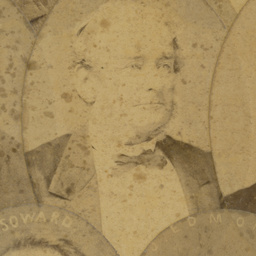 Duryea, Adelaide, 1872' at the bottom. 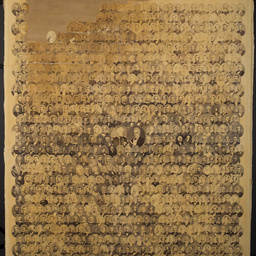 This mosaic includes portraits of Governor Sir John Hindmarsh and Governor George Gawler above 127 portraits, and the handwritten names of the colonists are listed under the ships they arrived below the portraits. 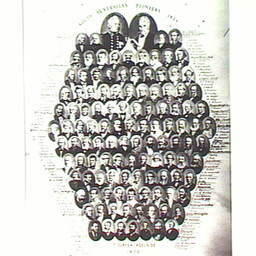 This mosaic holds 581 portraits, and represents a combined group of those portraits Duryea depicted in separate mosaics featuring male colonists who arrived in South Australia as adults in 1836, 1837, 1838, 1839 and 1840. All but three of the portraits on B 47770 are also included in Duryea's largest mosaic at B 8235. 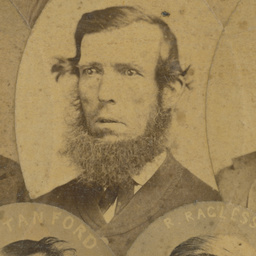 George Ragless arrived in South Australia in June 1838 on board the ship the "Eden". Farmer, 'Battersea', Edwardstown. Henry Thomas Morris arrived in South Australia in December 1836 on board the ship the "Buffalo". Manager, Anlaby station, Kapunda. 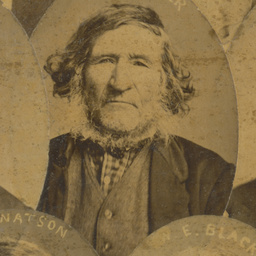 Edward Plummer arrived in South Australia in April 1840 from Launceston, Tasmania on board the ship the "Industry". Former convict, labourer, Inverbrackie, Woodside. 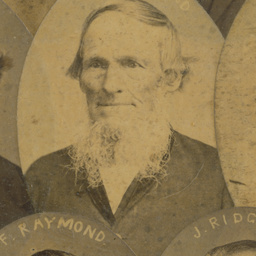 William Kelly arrived in South Australia in December 1838 on board the ship the "Lloyds". Farmer, Cudlee Creek. 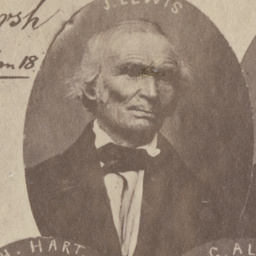 George Lewis Clisby arrived in South Australia in November 1838 on board the ship the "Rajasthan". Butcher, hawker, storeman; Adelaide, Yatala. Joseph Applebee arrived in South Australia in December 1839 on board the ship the "Duchess of Northumberland". Farmer, Port Gawler. Samuel Bakewell arrived in South Australia in November 1840 on board the ship the "Superb". Grocer, Member of Parliament. Jacob Bowden arrived in South Australia in January 1838 on board the ship the "Royal Admiral". Herbalist, Adelaide. 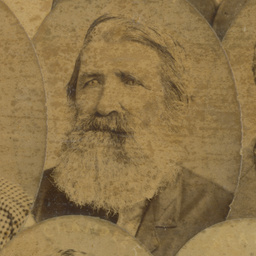 Dr Charles Davies arrived in South Australia in February 1840 on board the ship the "Branken Moor". 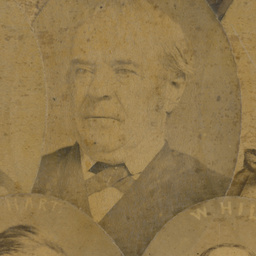 Medical doctor, pastoralist, Member of Parliament, North Adelaide. William Carman arrived in South Australia in February 1840 on board the ship the "Rajasthan". Blacksmith, wheelwright, publican, farmer; Adelaide, Lyndoch Valley, Chain of Ponds, Keilli. John Moore arrived in South Australia in February 1840 on board the ship the "Java". Farmer, orchardist; Hartley Vale. 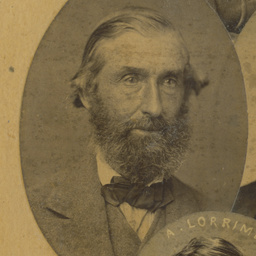 Probably George Joseph Linn arrived in South Australia in April 1840 on board the ship the "Morley". Woodcutter, Wallaroo; carter and farmer, Hindmarsh. 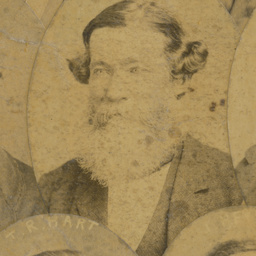 Captain Emanuel Underwood arrived in South Australia in March 1840 on board the ship the "Baboo". Sea captain, storekeeper, Port Lincoln. 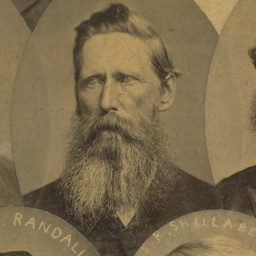 Edward Ronald arrived in South Australia in November 1840 on board the ship the "Diadem". Resident, Thebarton; Overseer of Works, Port Wakefield. 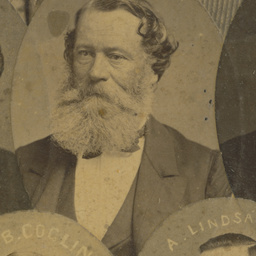 George William Cole arrived in South Australia in July 1839 on board the ship the "Lysander". 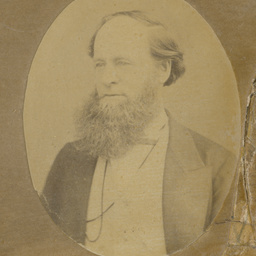 City valuator, Adelaide; Member of Parliament. James Kelly arrived in South Australia in June 1839 on board the ship the "Lady Bute". Drapist assistant, Adelaide; farmer, Woodside, Riverton, Giles Corner. 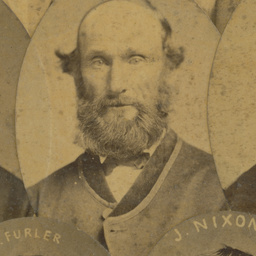 James Niall arrived in South Australia in April 1839 from Launceston, Tasmania on board the ship the "Look-in". Farmer, auctioneer, property owner; Dry Creek, Adelaide, South Stradbroke, near Magill. Charles Farr arrived in South Australia in March 1839 on board the ship the "D'Auvergne". Timber merchant, builder, Adelaide. 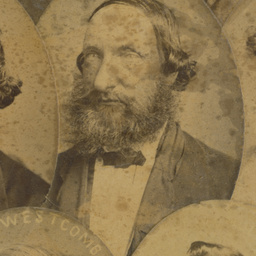 Charles Mosse Sprigg arrived in South Australia in December 1839 on board the ship the "Delhi". Farmer, Morphett Vale.